Last year, the Dutch Language and Culture school, De Esdoorn, held a small Koningsdag event for their students, their families and friends of De Esdoorn. 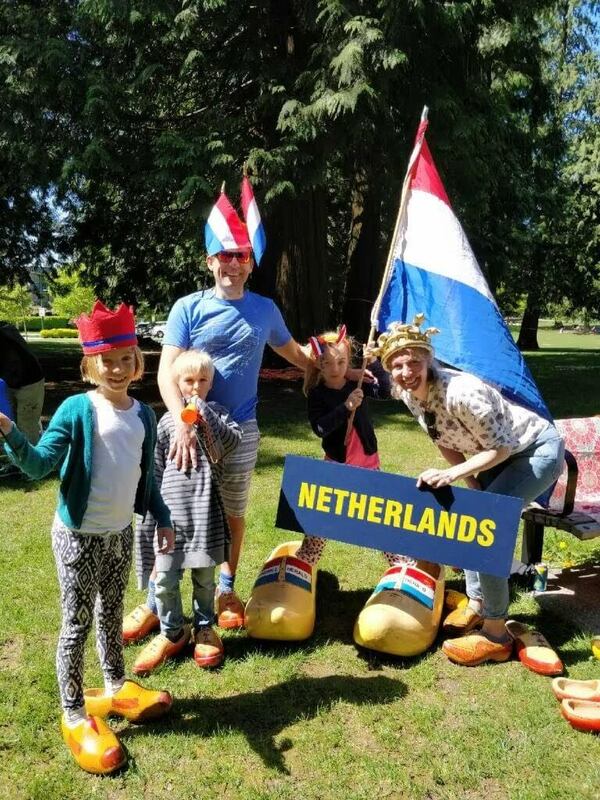 This year, De Esdoorn and the Dutch Network held a family Koningsdag event in Coquitlam on May 5 which also happened to be ‘Bevrijdingsdag’. After a week of frantically checking the weather forecast, we were treated with a beautiful sunny day in Blue Mountain Park. The kids had fun with the games, colouring contest, crafts, reading session, dress up corner and face painting. Adults enjoyed the sunny day in the park, the ‘vrijmarkt’ and the food sold by the food truck ‘Dutchlicious’. We held a small official ceremony with both anthems and concluded with the Koningsdagspelen song: “Fitlala”. Some children knew the song by heart and others joined the practice session. Thanks to everyone who came to this event. We are looking forward to next year and we hope you will join us too! We could not have organized this event with the help of the following people: Teachers Eline Naaijkens and Tamara Vincent, volunteers Inge van Ross and Edith Hicks, Rosa Dane for the wonderful face painting, the food truck Dutchlicious and board members of De Esdoorn and the Dutch Network. Thank you so much!